The lab extended its technique to create LIG on wood and even food, but 3D objects of pure graphene were less practical until now, Tour said. "Now we have built a prototype machine that lets us make graphene foam into 3D objects through automated successive layering and laser exposure," Tour said. "This truly brings graphene into the third dimension without furnaces or the need for metal catalysts, and our process is easily scaled." The team explains that the new method is based on laminated object manufacturing, in which layers of a material are assembled and then cut to shape. In this case, the bottom LIG layer remains attached to its polyimide base. A second layer is coated with ethylene glycol and placed facedown on the first. Its polyimide top is then burned into graphene; the process is repeated until the block is complete. The ethylene glycol binder is evaporated away on a hot plate and any remaining polyimide can be removed in a furnace. 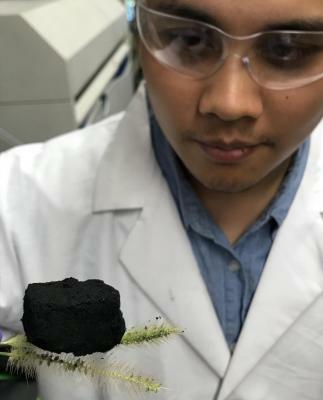 That leaves a pristine, spongy carbon block, said Duy Xuan Luong, a Rice graduate student and co-lead author of the paper. The Rice lab stacked up to five layers of foam and then used a custom-built fiber lasing system on a modified 3D printer to mill the block into complex shapes. The lab created proof-of-concept lithium-ion capacitors that used 3D LIG as both anodes and cathodes. The anode's gravimetric capacity of 354 milliamp hours per gram neared the theoretical limit of graphite, while the cathode's capacity exceeded the average capacity of other carbon materials. Full test cells retained about 70% of their capacity after 970 charge-discharge cycles. "This is excellent performance in these new-generation lithium-ion capacitors, which capture the best properties of lithium-ion batteries and capacitor hybrids," Tour said. The researchers then infused a block of 3D LIG with liquid polydimethylsiloxane through its 20- to 30-nanometer pores. This created a stronger (yet still flexible) conductive material without changing the original foam's shape. From this material, they made a flexible sensor that accurately recorded the pulse from the wrist of a volunteer and said further calibration of the device would let them extract blood pressure from the pulse waveform.